This week saw me posting a good loss. I feel like I’m back on track (like I ever really got off of it? ), but compared to last week’s 1.2 pound loss, this week’s loss is fantastic. I feel like I’m on pace to meet my December goal before Christmas, which would be a wonderful gift to myself. I am now 66 pounds away from my surgeon’s goal weight for me, but I’m hoping that by the time I see him again January 2 that I’ll be 50 pounds short of that. I am really hoping I can hit his goal weight for me by my birthday in March. That would really be something. I am almost halfway to my own weight loss goal. I think I might be able to hit the halfway point next week. We’ll see. I did a little cooking today to get ready for the week. I’m trying to get back into the habit after not doing it for a bit–I’ve been too damn busy working to spend time prepping meals. And thankfully, I had plenty of stuff in the freezer to eat that I’d made before. But I need to invest the time in meal prep to keep me from deciding to pick something up on the way home or going out for dinner. We have actually saved quite a bit of money not dining out nearly as much as we did prior to both of us having surgery, which has been nice. So I cooked a couple of things for both of us to have for meals this week: chili and barbecue chicken legs. Fall weather and cooler temps means that my grocery store now carries chili grind meat. What’s even better is that the grocery store we shop at (Central Market) carries extra lean chili meat–96% lean/4% fat. While we were shopping for the week’s groceries last night, I decided to pick up a package and make a pot of chili for the week. Now, in some places, chili has beans in it. This is Texas, where real chili is strictly meat, some sort of tomato base, perhaps onions and jalapenos, and spices. NO BEANS. So my version of chili lacks beans, but the tomatoes add a pretty decent amount of fiber for the serving size. Normally I would add onions but my husband is allergic to them, so I left them out of this recipe. 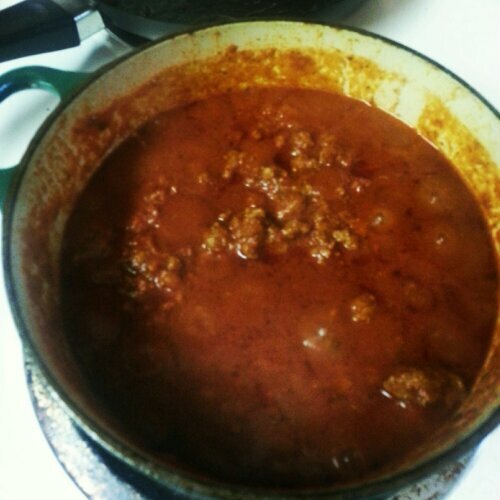 Real Texas chili does not have beans in it…this version is beanless. Use a small Dutch oven, and heat the grapeseed oil in it over medium heat. Brown the meat in the oil, drain if needed (I didn’t; the meat was really lean which is why I added the oil) and add the jalapenos and garlic. Stir in the crushed tomatoes with about 3/4 cup of water. Add the chili powder, and let this mixture simmer for about an hour, stirring periodically so that the chili does not stick to the bottom of the pan. It will thicken up as it cooks. After running the nutrition information through MyFitnessPal, a 4 ounce serving has 160 calories, 9 grams carbs (from the tomatoes), 5 grams fat and 20 grams of protein. Serve hot, with your favorite chili toppings. My recipe made 7 servings, which I’m pretty sure will all be devoured in the next couple of days. Today’s eating was okay. Got in the low end of my protein range: 80 grams. 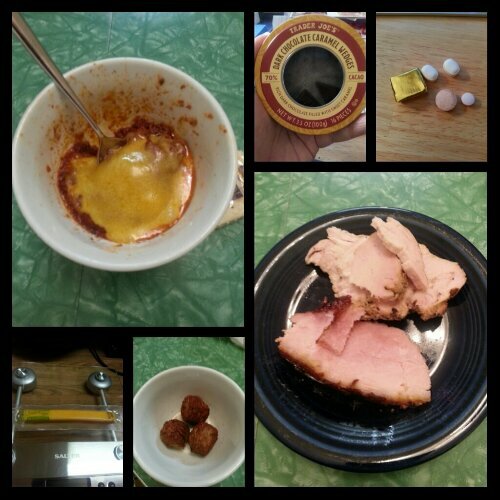 Sunday's food choices, from upper right: multivitamin and calcium supplements x2, B12 and iron supplements; Rudy's smoked ham and turkey; Trader Joe's turkey meatballs; Sargento reduced fat cheese stick; homemade Texas chili with cheddar cheese; Trader Joe's chocolate caramel wedges (2). 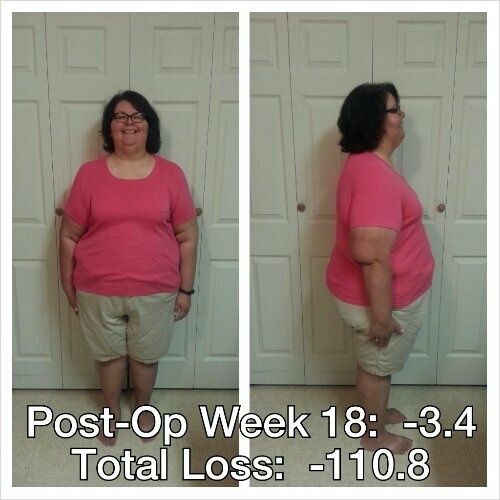 This entry was posted in cooking, daily bites, eating, goals, meal planning, post-op, progreso, success, the sleeve, vsg, weight loss surgery and tagged daily bites, eating, economies of the scale, goals, meal planning, photo post, post-op eating, post-op life, progress report, recipes, sleeve gastrectomy, sorry for sleeve rocking, VSG, vsg realness, WLS. Bookmark the permalink.